This week is a little more ‘back to normal’. We’re going for individual words that have to be included. 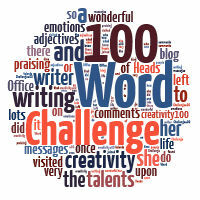 That means you have 105 words only. Please highlight / bold the words if you can as it makes it easier for your readers to see where you have used them and that will be useful for next week! If you are new here, please read through this INFORMATION. Click here to enter your link and view this Linky Tools list. It will take you to another page but if you tweet / leave a comment below, I will move it to this main page as soon as possible. Good luck! Hey Julia, I’d be glad to join.